F.A.Q.s What lens should I buy? 1) A lens that fits your type of camera, both brand and sensor size. A Canon lens won’t fit on a Nikon / Pentax / Sony camera. A lens designed for a smaller sensor won’t work on a camera with a larger sensor. 2) A lens that fits the type of photography you want to do. If you’re a birdwatcher get a long telephoto lens. If you’re into bugs get a macro lens. 3) You get what you pay for. But like most things the relationship between cost and performance is not linear. My brother asked this question recently so I can share the answer I gave him. About a year ago he bought his first digital SLR camera, a Nikon that came with two kit lenses a 18-55mm and a 55-200mm. He wanted a new lens to broaden his horizons (Insert pun about buying wide angle lens here.) and help improve his photographic skills. I recommended that he should get Nikon’s 50mm f1.8. 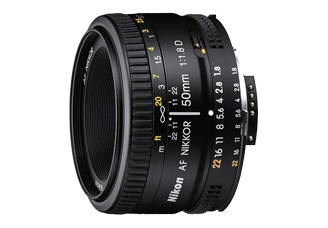 Price: There are other 50mm prime lenses by Nikon, but the F/1.8 will give him the most bang for his buck. ( f/1.8 $120, f/1.4G $350, f/1.2 $650) Nikon’s f/1.2 50mm is actually an older manual lens, Canon has a modern L series autofocus 50mm f/1.2 with a list price of US1800. Utility: A fast, bright lens that can open up to 1.8 will allow him to experiment with shallow depth of field. I think he will really enjoy shooting portraits with this lens. Weight: Put the 50mm on the camera, leave the bulky zooms at home, and you have a great lightweight system. You’re more likely to take the camera with you if it isn’t a burden. Simplicity: By removing the ability to zoom, it simplifies the process of taking a photograph allowing you to concentrate on other aspects. Focus, aperture, composition. It’s a good way to hone your skills. Full frame lens: It’s not important now, but if my brother ever buys a full frame Nikon body he can still use this lens. The Nikon 50mm 1.8D is my most ‘expensive cheap’ lens. Expensive because it gives fabulous results. Cheap for the price! In the case of this lens, you don’t get what you pay for, you get a whole lot more. GREAT choice!